Set your sights on the outputs in the distance, not the inputs lining up at your feet. I worked with a programmer who, when hearing a request suggesting how to do his job, would reply, “just tell me what you want the report to look like.” Focus on the output. On this second weekend of 2019, plan to try some new things next week in order to fight decline. If they don’t amount to anything, or simply don’t work, ditch them. New exercises will keep your brain fresh. Finding time to try new things is a challenge. To help, give yourself more flexibility by learning to say “no.” The careful use of your yeses will create time to experience new things. 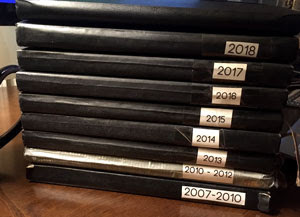 Let your mind reflect on your many experiences from last year versus fretting over time slipping away each time you write “2019.” You may not have accomplished everything on your list, but you experienced a lot. Let it soak in. “I can’t fast forward time and I can’t make people move faster…the only thing I can manipulate is me.” – Nedra Glover Tawwab, social worker, in the NYTimes. This week I talked to a few job-hunters and my usual grip of business development peoples. At a high level, it’s a similar conversation because in order to be effective in either finding new business or a new job, it’s best to focus on what you can control. Sounds easy, but it’s not. What the prospect/employer thinks of you, specifically. The prospect/employer’s ability to do their job. The prospect/employer’s interactions with others. How the prospect/employer takes our advice. How the prospect/employer reacts to stressors. How the prospect/employer acts vs. our instruction. Looking at that grid up top, it’s lower right. High-control for us, low-control for them. 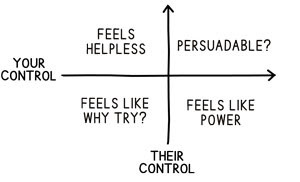 The spot I see both business developers and job hunters get stuck is where we have high-control, and the prospect/employer has high-control. It really feels like we should be able to influence or persuade them, but it’s tough work because so much of it is in their control. It’s like when I go to walk Wilson the Amazing Border Collie. He loves walks, but when I move toward him with the harness, he moves away. When I pull him close to attach buckles, he pushes away. Even though we both want the exact same outcome, we can’t seem to agree on how to get there. My advice is to concentrate on the areas you have in your control. Focus on the purity of your intentions, and get better at your technique. The rest will take care of itself. And if you’re trying to walk Wilson, move away from him with the harness and he’ll come to you. Crazy dog. Are you going to write this down? 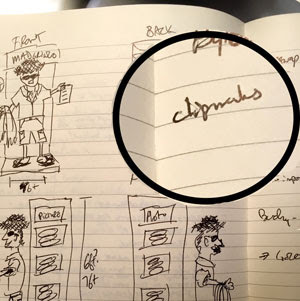 I have always scribbled notes and ideas. Whether it was on legal pads or my Filofax, I mark papers up and keep them around. 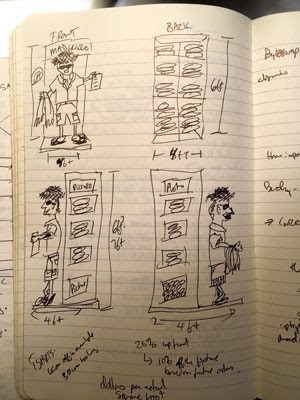 When I started my little clothing company, Mad Gringo, I stumbled on the Moleskine notebook. Black, hard cover, lined pages, a ribbon to mark your page, plus a little pocket in the back to hold receipts. I’ve used them ever since. No idea what I was thinking. I can only hope that someday at my funeral the priest will pull it out like in Heathers.